Egyptians walk past bodies following a gun and bombing attack at the Rawda mosque, roughly 40 kilometres west of the North Sinai capital of El-Arish, on November 24, 2017. Gunmen who attacked a mosque on Friday in Egypt’s North Sinai brandished an Islamic State flag as they opened fire through doorways and windows, killing more than 300 worshippers, including two dozen children, officials said on Saturday. The assault on a mosque has stunned Egyptians, prompting President Abdel Fattah al-Sisi’s government to tighten security at places of worship and key buildings, and call three days of mourning for the bloodiest attack in Egypt’s modern history. 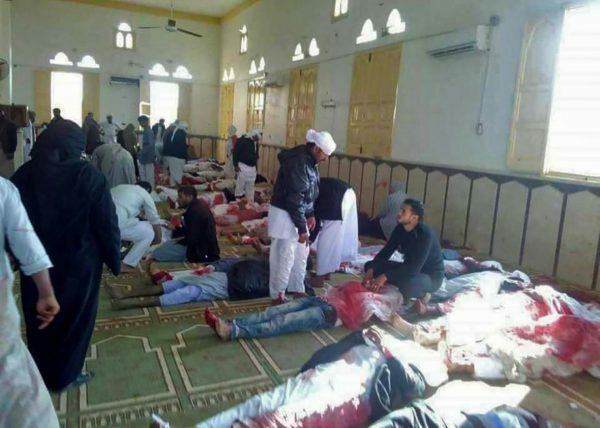 Egypt’s public prosecutor’s office, citing interviews with wounded survivors as part of its investigation, linked Islamic State militants, also known as Daesh, to the attack on the Al Rawdah mosque in Bir al-Abed, west of El-Arish city. Local sources said some of the worshippers were Sufis, whom groups such as Islamic State consider targets because they revere saints and shrines, which for Islamists is tantamount to idolatry. Islamic State has targeted Sufi and Shi‘ite Muslims in other countries like Iraq. Egypt’s military carried out air strikes and raids overnight to target hideouts and vehicles involved in the attack, the army said, without giving details on the number of militants. “What is happening is an attempt to stop us from our efforts in the fight against terrorism,” Sisi said on Friday. The Sinai attack came as Sisi’s government looks to draw more foreign investment and finish an IMF reform program to help revive an economy that struggled through instability after the 2011 uprising ousted long-standing leader Hosni Mubarak.